Tomatoes and Peppers and Basil, OH MY!!! Please stop on over to Julie’s Blog or her Facebook Page and show your support! I know I’ll be watching the outcome of this story closely! GO, Julie!!! I know…you are drooling about now too, right? This is called Mystery Mocha. The “Mystery” is the gooey goodness underneath the crunchy brownie-like surface. The “Mocha” refers to the subtle flavoring of coffee that comes from the cup of java that is poured over the batter before baking. It sounds weird, I know…but the results are nothing short of amazing. I followed the recipe which Pioneer Woman has step-by-step photo instructions for here, except I substituted my favorite Brown Rice Flour Mix (see proportions below*) for the all-purpose flour, and I added 1/8th tsp Xanthan Gum in with the dry ingredients. This is what it looked like when it was finished baking. We scooped Vanilla Ice Cream atop each serving while the cake was still warm. 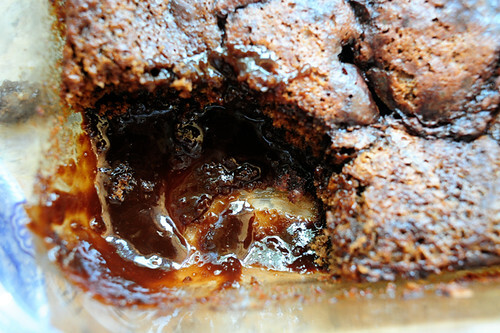 Here’s a peek at the gooey goodness beneath the crust. This would make the perfect Valentine’s Day dessert and is guaranteed to put your sweetie under your spell! Unless, of course, your beloved isn’t into chocolate. Then again, WHO doesn’t like chocolate?!?!? *Brown Rice Flour Mix: 2 parts Brown Rice Flour, 2/3 part Potato Starch, 1/3 part Tapioca Starch – whisk together and store in a sealed container. Yes, those are little carrot hearts! Isn’t that sweet? This is my husband’s veggie soup recipe which has always been a family favorite. One Valentine’s Day, being the romantic that he is (cough, cough) he made it special for the occasion, turning the carrots into little love messengers! Since that day, the recipe has been known as Love Soup! Note: Those two suspicious looking jars in the back are NOT salsa. Those are home grown tomatoes from last summer which have been blended, cooked and frozen in quart containers. In leiu of frozen or fresh blended tomatoes, you can use canned tomatoes, but I’m warning you: The flavor will not be near as good and I will not be held responsible for the results! Throw the celery into the pot with the oil and onions. Now, slice the length of the carrot. Almost too cute to put in the pot, but do it anyway. Turn on the heat and cook until onions and celery are slightly tender. While they are cooking, you can chop your potatoes into 1/2 inch cubes. If you are going to take a photo at this point, don’t get too close. Then, you will have to clean your lens. Add vegetable broth to the pot. Drain and rinse 3 – 15 oz cans of beans. You can use whatever variety you like. These are Light Red Kidney, Great White Northern, and Black Beans. They look very happy together, don’t they? Add the beans to the pot. Then, chop 1/2 head cabbage. Now, add the tomatoes and stir. Place some of the soup mixture into your blender container. It looks gross, I know. But you must trust me. We use a lot of this stuff, so I bought it in bulk. I order most of my herbs and spices from Monterey Bay Spice Company and from Mountain Rose Herbs. Mountain Rose caters more to the organic product line, but both have great deals on bulk products. You will pay WAY less for a 1/2 pound at either distributor than you do in the grocery store for a tiny little 2 oz bottle. Just don’t order more than you can use in a six month period, because you don’t want your herbs to lose their health and taste benefits! How’s everybody doing in there? Okay? Good. Now, for my favorite….Garlic! You need 10 cloves. Mince them up and add them to the pot. Incidentally, an easy way to peel the garlic is to place the cloves (or the whole head in this case) into the microwave on high for about 15 seconds. When you cut the end of each clove, the skin should just slide right off. These guys just came out of the freezer, and actually they are Jalapenos from our garden last year. We just wash, dry and freeze them whole in ziploc freezer bags. These guys are ready for a dip in the “hot tub”, I think. What about the corn? Did she forget about the corn? No. I would never be so cruel. The corn is special. We wait to add it until after the soup is blended. You are going to have to take my word for it, because I didn’t take a photo, but ours went in now. Then we lightly sprinkled in some crushed red pepper flakes for a little zip. If foam develops on the top of the pot during cooking, just skim it off. You’ll need to cook this soup over low/medium heat for 1 to 2 hours, stirring every so often. Then, remove the peppers and let it cool. DON”T EAT IT! Okay…one little taste, just to check for seasoning. Add salt and pepper if needed. But don’t get carried away. You really have to wait until the following day for the flavors to fully develop. Heat and serve topped with parmesan cheese, with a nice crusty bread or crackers on the side. This soup is so healthy and satisfying and completely guilt free, so no matter if you have more than a couple bowls! Enjoy! And by the way, since you have SO much soup to share, invite the neighbors over to enjoy it along with you! This recipe was really ridiculously easy to formulate. After all, the (incredibly simple) ingredient list on the package practically gives away the whole recipe! My very good friend (who is gluten intolerant) brought my son a handful of Larabars one day so he could try them out. He liked them and I sneaked a bar and liked them too! Purchasing a few each time I make a trip to Whole Foods has become a habit I just can’t break. But at over $1 a piece, it was wearing on my frugal nature. So, when I saw a big package of dates on sale at Costco recently, I picked them up determined to give making my own a try. I didn’t take photos of the process, because frankly I just wasn’t sure how they would turn out. But they tasted phenomenal so I decided to just go ahead and give the recipe to you sans the step-by-step photos. I just could NOT wait to share the secret! This recipe is the mock version of the Cinnamon Roll Larabar, which is my personal favorite flavor so far. Process nuts in bowl of food processor until coursely chopped. Remove to a bowl, add cinnamon to nuts and toss together well. Add 1 cup of dates to bowl of food processor and pulse until chopped. They may clump together in a lump. That’s okay. Add nut mixture to processor and pulse just a couple times until combined. Remove mixture to bowl and work together using your hands or a wooden spoon. If it seems too crumbly, chop a few more dates in the food processor and add to bowl as needed until mixture holds together well. Line a baking pan or cookie sheet (I used an 8 x 8 square pan) with parchment or waxed paper, coming up the sides of the pan. Press mixture into pan by covering mixture with another sheet of parchment or waxed paper and using your hands to apply pressure. Smooth the mixture until it reaches the edges of pan (or about 1/3 to 1/2 inch thick if your pan is larger than 8″ x 8″). Place in refrigerator for a few hours, then cut into rectangles or squares using a sharp knife. Store bars in the refrigerator in a covered container or wrap each bar individually for easy on-the-go snacking! I’ve been exercising a lot more lately (there will be more about that in a later post), and I love these bars because when it’s been a couple hours since a meal, and I’m heading out the door to go to my class, it’s great to be able to grab something quick that gives me energy but isn’t too heavy and won’t weigh me down or leave my stomach too full. These bars fit the bill! Who doesn’t love to trick their kids? Especially when it comes to eating a healthy balanced diet! This trick is an old one for us, and it originated when my Mother-in-law would make these plates up for the boys’ during their overnight visits. Although both my spawn have aged into the double-digits, they still enjoy it when I (or their Granny) makes them up a “Super Secret Surprise Sampler” plate to nosh on for old times’ sake. Start with a plate. Any plate will do, but a sectional one, or even a muffin tin is especially nice. Wash and cut some fruit and/or veggies: carrots, cucumbers, apples, bananas, oranges, whatever. Add a dipping cup (or two) of peanut butter, Nutella, or ranch dressing. Include whatever sweet or salty snack you have around like cookies, chips, nuts, or pretzels. This is a great way to get rid of those nearly empty containers of stuff in the cupboard! How about a cup of applesauce, yogurt or cottage cheese with some candy sprinkles on top sitting in the center of the plate? I always make sure there is something chocolate in the mix too! M&Ms or a fun size candy bar are perfect! You’ be surprised to know that the sweet stuff is not always the first to be eaten, and you’d also be amazed at what new (or usually shunned) foods the kids will try when it’s presented in this manner. They also can get quite creative with the “recipes” they invent from the ingredients at their disposal. How does a ranch and M&M sandwich on crackers sound? Ewwww!!! If you’ve got really little kids, you can even shape the foods into a face, or something artsier if you possess such talents. You might encourage the kids to play with their food, or to build something using peanut butter or hummus as the “glue”. Above all, have fun! These plates are an even nicer treat when the kids aren’t feeling too great. My baby has a cold right now and he enjoyed his most recent sampler plate snuggled on the couch in his jammies. Oh…and this is probably THE most important thing: Do NOT let the kids see what is going onto the plate until they sit down to eat it! That’s where the “Super Secret” part comes in! After all these years, my kids still excitedly anticipate what they’ll find when I tell them that I’m making them up a Super Secret Surprise Sampler! When I made the new bread recipe yesterday, I immediately thought that it would be perfect for French Toast, so this morning the boys enjoyed one of their favorite breakfasts! Growing up, French Toast was one of the few things my mother made from scratch, if you can call dipping slices of store bought bread into beaten egg “from scratch”! I grew up in the 70’s and 80’s and boxed mixes and frozen dinners were di riguer for us when “eating in”, but I really remember us subsisting mostly on fast food: takeout pizza, Jack In The Box, McDonalds, Taco Bell and Chinese carry-out. At least I can say that our fast food diet was varied. Anyway, Mom always told me that the reason her French Toast was better than others was the Nutmeg – just a dash -that she added to the egg mixture along with the Cinnamon. I don’t really know if its true that most recipes for French Toast don’t already call for Nutmeg, since I guess I’ve never searched for a replacment. I’ve just always made it Mom’s way, and now I can carry on the tradition to my kids by making the claim that my French Toast is The Best and passing along the family secret to them. Break eggs into a shallow dish and add milk, Cinnamon, Nutmeg & Vanilla. Combine together with a fork or wire whisk until frothy. Melt butter in skillet or griddle over medium heat. Lift carefully onto prepared pan. Cook each side until crispy and browned, then flip to cook other side. Serve hot with butter, powdered sugar, and syrup or any other of your favorite toppings! Oh…and if any of you are inclined to set me straight on this, I really dont wanna know. I’d like to remain blissfully oblivious, thankyouverymuch! I haven’t tried any new bread recipes in a while, but I think my son has been growing bored with the selections I usually bake to keep on hand. We’ve actually been buying Udi’s Gluten Free Bagels quite often lately. Have you tried these yet? They are expensive (about $7 for a pack of 4 at Whole Foods) but they are really, really good. I’ll have a great sandwich recipe featuring those posted here on the blog soon. In the meantime, I have a new bread recipe to share with you. I just tried this for the first time today, and this is a very close adaptation of a recipe from Easy Gluten Free Baking, by Elizabeth Barbone. I’ve tried her recipes before, and they always turn out fabulously. One of my very first posts here was her Gluten Free Sandwich Bread, and recently we tried (and loved!) her Belgian Waffles. My Mock Wheat and Mock Rye loaves are both adaptations of that Gluten Free Sandwich Bread recipe. The only modification I made on this particular recipe was the omission of the Sweet Dairy Whey Powder. I subsituted more nonfat dry milk in it’s place and although I don’t know how it would have turned out as written, I am very happy with my results! So is my son, and that is the most important thing! Lightly grease (use nonstick spray or canola oil) a 9 x 5 inch loaf pan and line bottom with parchment paper. Place brown and white rice flours, dry milk powder, corn and potato starches, brown sugar, xanthan gum and salt in a medium bowl. Combine with wire whisk until well incorporated (you might have to use your hands to break up any brown sugar lumps). Combine wet ingredients- warm water, eggs, melted butter and yeast – with a whisk in bowl of stand mixer until yeast is dissolved. Place bowl on mixer stand, add flour mixture to bowl and combine using beater attachment for one minute on low speed. Mix on high speed for 5 minutes. Spread into prepared pan, using a wettened metal spatula to smooth the top. Cover loosely with plastic wrap which has been sprayed with non-stick cooking spray, and let rise for 40 – 60 minutes, until dough reaches just past top of pan. Remove plastic wrap and bake at 350 degrees for 55 – 60 minutes (or until quick read thermometer reads 208 degrees). Let cool in pan for 5 minutes, then remove from pan to wire rack and let cool completely before slicing. I think this bread will make a fabulous French Toast, so I am going to put that on the menu for our Sunday breakfast tomorrow! I can’t wait! Have a wonderul weekend, Everyone! How did YOU spend your last evening in 2010? We celebrated at home with a little party just for us, teaching the kids to play poker and eating snacks. I made Layered Fiesta Dip and The Evil Dip for all of us to enjoy with Tortilla Chips while we homeschooled the kids in the fine art of bluffing and knowing when to hold ’em and when to fold ’em. It’s kind of fun to take advantage of the rookies. We stayed up until Midnight, pouring glasses of “Champagne” just before the ball dropped. When 2011 made it’s debut, it was time for a toast and kisses all around, and then we were all off to bed. I started off the New Year the next day with a new recipe that was good enough to share. Simple, too! Unfortunately, there are no Black Eyed Peas in this one, so I’m not sure how our luck will run for 2011, but the Black Beans were delicious when combined with corn (leftover from dinner a few nights ago), red pepper, green onion, cilantro and lime juice. I’d say that’s a lucky combination anyday! Place Black Beans and Corn in a medium bowl. Add chopped Green Onion, chopped Cilantro, chopped Red Pepper and Salt. Add Lime Juice. Don’t be like me and try to take a photo while pouring or you’ll end up with Lime Juice on your counter like I did! Oops!! Stir to combine all ingredients together. Place in serving dish, and enjoy! This salad is great all by itself, or served beside a sandwich (try it next to a veggie burger topped with melted pepper jack cheese, salsa, shredded lettuce and guacamole) or as a component of an awesome Taco Salad. May your New Year be as wonderfully colorful as this salad! Cheers!! !